If you are enjoy and love this Yashfa Theme, help me spread this themes to the world. I am using this theme for a committee site for the upcoming PGA Championship at Hazeltine next week. I am having problems with the submenu flyouts in IE. Submenus look great in Safari & Firefox, but do not show in IE 6. I see there is a “fix menu” in change log 1.2, but I don’t know I access that info. Any insight? saya menggunakan theme ini untuk website saya..awalnya tidak apa2 tetapi kenpa bisa menjadi sperti ini ya? saya tidak sengaja merubah di editor CSS nya..
Love the theme, but the list of pages at the top goes down into myheader photo. Anyway to hide some of the pages at the top? I don;t know if the pages are subordinated to another one, but for me worked when I put some of the subordinated as “private”, since I have other ways (on the side bar) to make people get there. 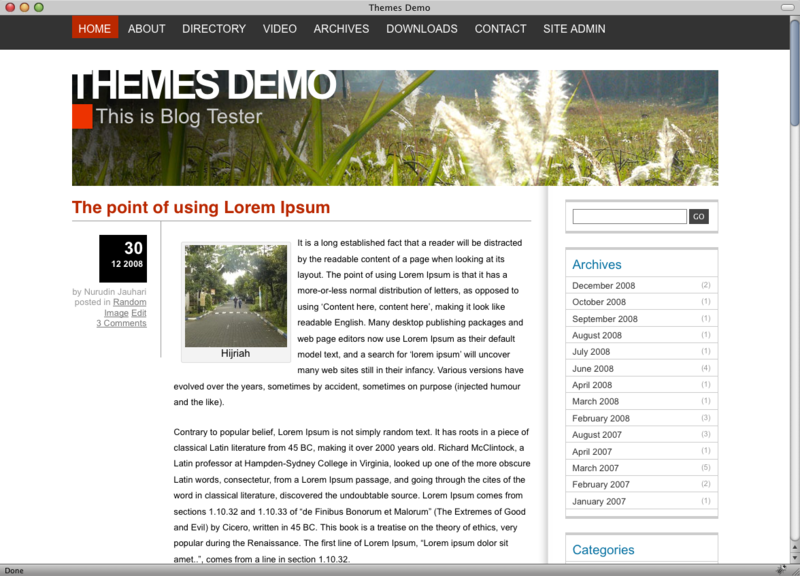 love the theme, one problem I have is when I use a static page. When I am on the blog page, both the static front page and blog page are highlighted as if I am on both of the pages. How would this be fixed? Thank you! It would be great if this theme had an automatic update. Brilliant theme, but I cant get it to add widgets at all. Its the best theme I have found so far…aprt from this little problem. I would like to know how to remove Recent Comments, Tag Cloud, & Last Post from the footer. Would anyone help me with that please? I am very new to wordpress so I would need it explained in very simple terms. Please, I’d love to have this information too. My sidebar doesn’t appear on any of my posts. It appears everywhere else, except when I click on a certain post. How can I fix that so it’s always present like the header and footer? Thanks for the great theme! I am having problems with the theme working with the latest version of Lightbox Plus. The image caption is not displaying correctly. However if I use another theme it does display as it should. Is there anyway this can get fixed? Can you show me with some screen shot, about your problem?